Antiques, oftentimes, are treated like precious and rare artifacts, put on a shelf to be admired—but not touched. In such a setting, it can be hard to get your brain around just how it was used in day-to-day life. 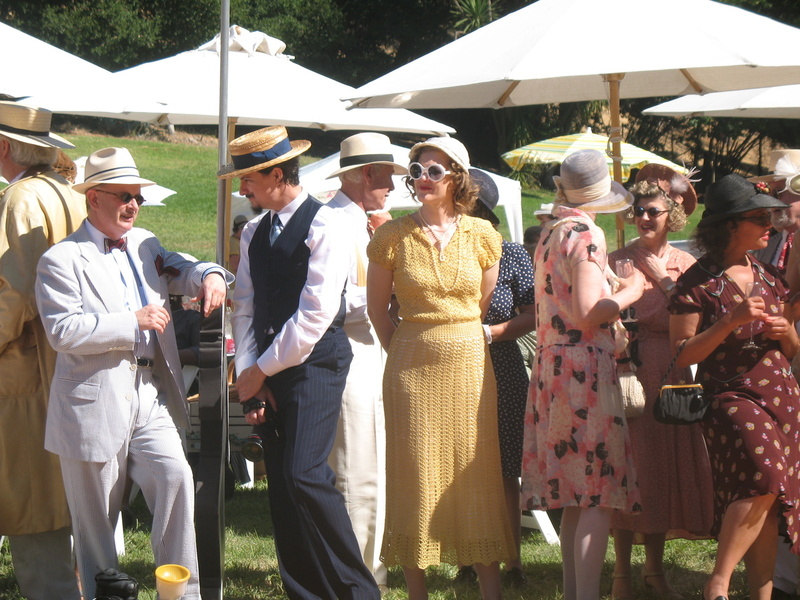 The fantastic thing about the Gatsby Summer Afternoon, held every September in the hills of Oakland, CA, is that collectors get to show off and put their antiques to use at the same time. And they don’t just showcase one kind of antique—it’s cars, it’s clothing, it’s glassware, dinnerware, and linens, it’s chairs and tables, it’s suitcases, guitars, cameras, and phonographs—all things you could find in the 1920s and ’30s. The Gatsby Summer Afternoon, put on by the Art Deco Society of California, feels truly like a journey back into the Art Deco-era — it’s almost like being on a movie set, the illusion is so real. Held on the sprawling 37-acre lawn of the Dunsmuir Hellman Historic Estate, the picnic is meant to re-create the elegant afternoon parties Jay Gatsby would hold in F. Scott Fitzgerald’s beloved novel. 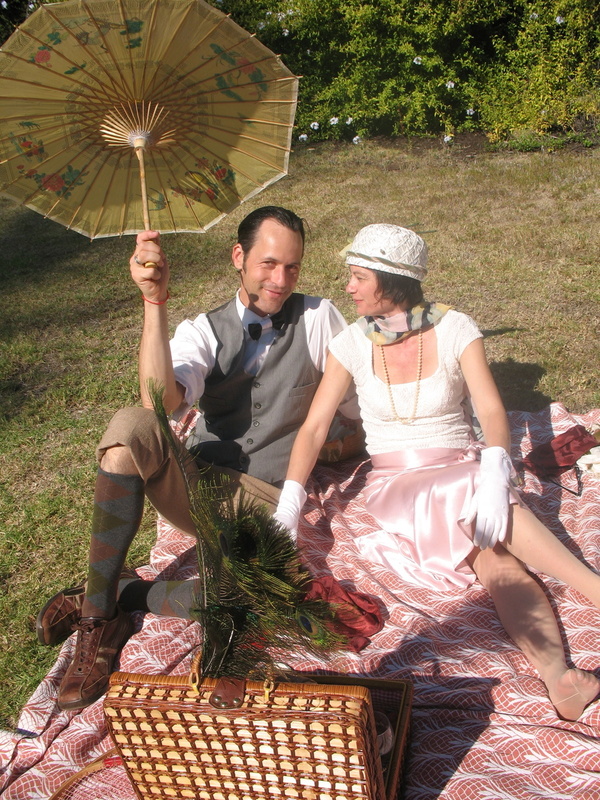 Picnicking at the Gatsby Summer Afternoon requires a good deal of commitment. The admission is steep ($40-$70) and the “How to Gatsby” site lays out stringent requirements: “For a period picnic, please, no plastic or Styrofoam!” The site also specifies no flapper dresses, no flowing long hair, no denim, no miniskirts, no sneakers. For ladies, hats, gloves, and jewelry are required for a complete, sophisticated look. So for a newbie, it’s quite the learning experience to totter around on high heels in a slinky dress, managing heavy antique plates and glass bottles in a picnic basket with gloves and a parasol to boot. You realize that people living in the ’20s and ’30s had to possess an extra dose of grace and balance. What’s even better is being immersed in this other world, watching people glide by in such elegant vintage attire, dancing the fox trot and Charleston to the live sounds of the Royal Society Jazz Orchestra—or eating off their fine antique silver and china. At each picnic, whether it be a table or a blanket, collectors show off their most prized antiques. For example, Jason Hale showed me his gorgeous Victrola gramophone, which had amazingly survived the 1906 San Francisco earthquake and fire, with only a crack in the horn, made when it was rescued from a burning home. I saw many wonderful picnic suitcases, pieces of Depression glass, and toys and games. My favorite was an old Carrom board that Gretchen Burgess and Anthony Shannon found at a garage sale. This wooden tabletop game was designed for more than 100 games, and hours of family fun. The highlight of the event every year is the performance by the DecoBelles—created and still managed by Gordon herself. These dancing girls wear vintage bathing suits, which were considered racy at the time but are modest by today’s standards. This year, the ladies, also wearing high heels and knee socks, performed a chorus-line style dance to “The Sentimental Gentleman From Georgia.” Afterward, the reigning Miss Art Deco, Eva Garcia, passed her crown onto the new Miss Art Deco, Kristi Major, a programs director for the Art Deco Society. See more Gatsby Summer Afternoon antiques, fashion, and stories on our Show & Tell page. If you went to this event—or if you just love the ’20s and ’30s—feel free to add stories and photos of your own. What a wonderful article…love all the “blue links” so that you can learn even more about all the aspects of this event. Read it twice! The first time through gives you the story but a second reading clicking every link opens many more photos and points of interest. “Hats off” to the author, and also to this year’s event chair, Heather Ripley , who did such a marvelous job ! Lisa, again, wonderful write up. Glad I could be a tiny part of helping you put together your time-traveling alter ego. Sad that I didn’t get my act together to go this year, but looking forward to 2011! Very nice writing…also, your take on this subject is refreshing and correct..
“ ” Dogs were fed kitchen scraps or ox-foot stew.